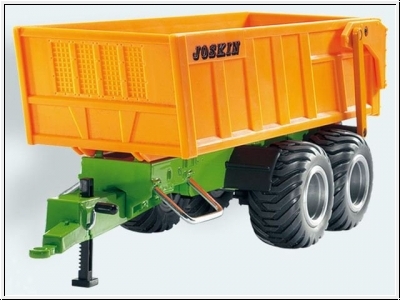 Electronically controlled tandem-axle trailer with independent power source by battery. The trailer is connected to the tractor via a data cable. The trailer's dumper is electronically tilted to the rear. The existing remote-control module can be used to activate this function. At the trailer's rear, red and orange LEDs create rear light and indicators. 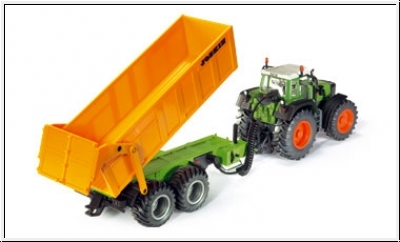 Due to the independent power source, the trailer can also be operated without control tractor or via the remote control unit. The relevant switches are fitted on the model, so that the tilting and lights can be controlled. This Product was added to our catalogue on Wednesday 08 July, 2009.